Mid sixties JCPenney store sitting in the rain looking very melancholy, in downtown Salem, Oregon. This photo was taken on January 2, 1965, and shows the then newly constructed JCPenney retail store on Liberty Street. (Excerpt) The music darts into the ear, does its subtle job in the subcortex of the brain, then slips out the other ear without saying goodbye. The listener is all but unaware that he has heard anything, but the music has sloshed around inside his head, and, relieved of the humdrum business of thinking, he feels better immediately. His mouth smiles. He likes his work, loves his wife, spends his money. The only thing he has to fear is silence, but thanks to a company called Muzak and its many imitators in the background music business, he has nothing to worry about. Loudspeakers are everywhere. The total musication of America is by now almost complete. Muzak gets the credit for being the biggest noise maker of all, a feat that brings in $15,000,000 a year from its 30,000 subscribers. The soft comforting sounds that ooze from Muzak's speakers are heard each day by more than 60 million people—in hospitals and mortuaries, elevators and space capsules, prisons and jute mills. 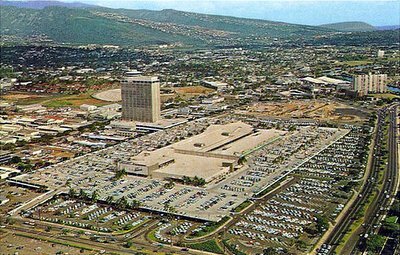 Ala Moana Center was once the largest shopping center in the United States and currently holds the distinction of being the largest open-air shopping center in the world. Located at 1450 Ala Moana Boulevard in Honolulu, Hawaii, Ala Moana Center is part of the commercial, retail, and residential district of Ala Moana, west of Waikiki and across from Ala Moana Beach Park. Ala Moana Center is renowned throughout Asia and Western Europe as a major international shopping destination. There are more than 260 shops and restaurants, including boutique stores of leading international fashion designers. Its current anchor tenants are Macy's, Nordstrom (opening 2008), Neiman Marcus and Sears. The Center boasts one of the world's largest food courts, featuring cuisines from around the globe. 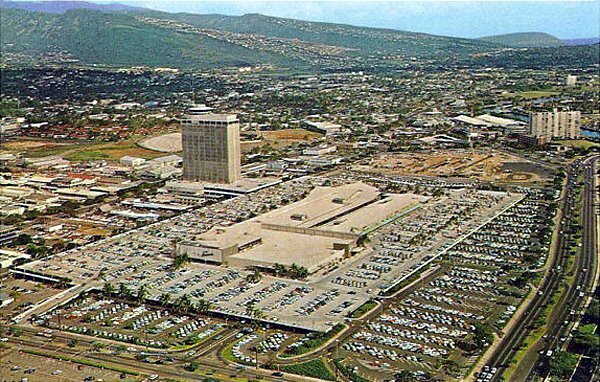 Over 56 million people visit Ala Moana Center annually. Chicago-based General Growth Properties, which trades on the New York Stock Exchange as GGP, owns and operates Ala Moana Center. Oh, and if you haven't already, be sure and check out the cool virtual mall tour I mentioned in an earlier Ala Moana entry. Pretty neat stuff. By Jim Borgman, Cincinnati Enquirer. 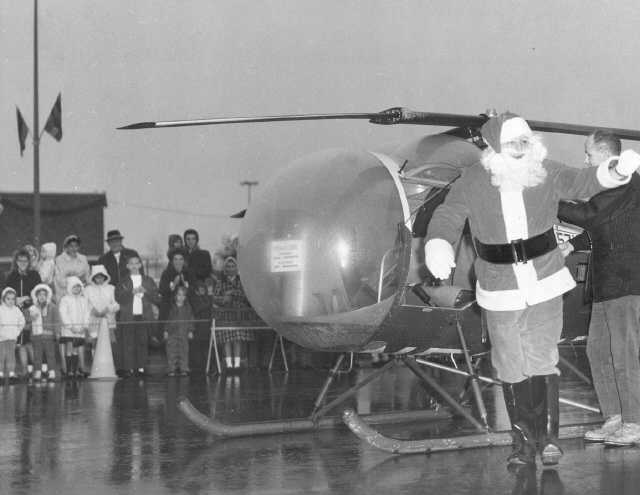 "Wet weather did not delay Santa's arrival at the Tacoma Mall Shopping Center on November 26, 1965. He simply donned rubber boots and caught a ride with a Kent-based helicopter. Santa waves a cheery hello to the smiling crowd of old and young. He had circled the mall twice before landing at the Tacoma Mall's main entrance and then marching to his throne at his North Pole mountain in the center of the mall." 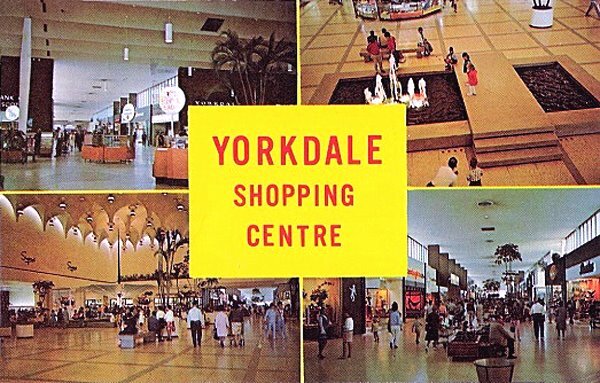 Yorkdale Shopping Centre postcard. I've had many requests to feature this groovy mall sometime, so here's a start. 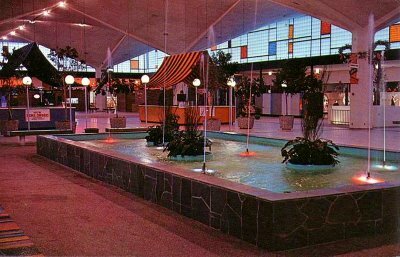 This popular Canadian mall had such an incredibly colorful and swinging looking interior in its early "vintage" years, there's just no way I can not post photos of it! There will be more down the road. Yorkdale Shopping Centre opened its doors and the old Toronto Telegram marveled: "The 100 stores and shops of Yorkdale are all air-conditioned and if the cooling systems... were making ice cubes, they could produce a single stack 55 miles high every hour on the hour...", "...Just marvelous, say the ladies after a Tely tour!" Yorkdale generated a tremendous amount of excitement. Before Yorkdale, everyone did their major shopping downtown. Yorkdale was at the edge of town, with nothing around it. Its gross leasable area was over a million square feet, by far the biggest in Canada. The shopping centre had 40-foot-wide malls and 27-foot mall ceilings which was, and still is, rare. 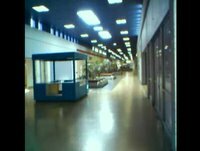 Here's another cool dead mall video (Houston Mall) I came across a while back and found interesting and wanted to share here. This one comes courtesy of YouTuber, wkat950, who shot and edited it himself, and I think he did a nice job--I'd have picked some different music myself, though, since this piece was already used to good effect in one of the Dixie Square Mall teasers I posted a while back. "A video of the Houston Mall in Warner Robins, GA. Houston Mall opened in 1972 and was extremely busy even after Macon Mall opened 3 years later. 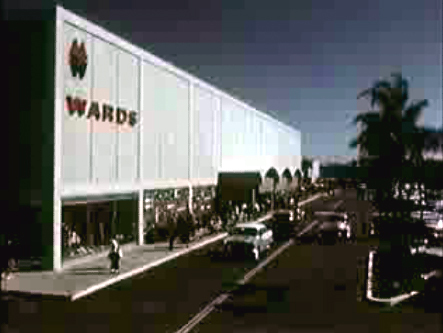 Its tenants included Sears, Belk-Matthews, WT Grant, and on the strip wing Winn-Dixie. Elmore's discount store and Eckerd Drugs were near the Grant court along with Chick-Fil-A. In 1994 the Galleria opened down the street and siphoned most tenants out. Today Houston Mall is slowly trying to populate its spaces. Houston Medical Center rents a third of the mall including the old Sears. The rest of the tenants are the Municipal Court, a few medical offices, beauty-related stores, a home decor store, a used office furniture store, and the Air Force Reserve Band. Despite a stated 85% occupancy (per July newspaper article) the mall is still a 'dead' mall." (Excerpt) Do a Google search on "Cyber Monday," and you get as many as 779,000 results. Not a bad haul for a term that was created just a week and a half ago to describe the jump in online shopping activity following the U.S. Thanksgiving holiday. While Black Friday is the official kickoff of the traditional retail season, the story goes, online retail really takes off the following Monday. Just one problem: It's not true, at least for many online retailers. Contrary to what the recent blitz of media coverage implies, Cyber Monday isn't nearly the biggest online shopping or spending day of the year. It ranks only as the 12th-biggest day historically, according to market researcher comScore Networks. It's not even the first big day of the season. Exterior view of the J.C. Penney Co. store (before it moved to nearby Lakeview Square Mall, where it still resides) along Michigan Mall, an outdoor pedestrian shopping strip area in Battle Creek. I don't see shots of the old Penney logo in this color and style very often. Thought it was kind of interesting and different. I'd imagine it was simply a holdover design at this point, from a more vintage era. Vintage exterior postcard view of Michigan's Victor Gruen beauty, Northland Center, as seen from the parking lot, where you can see the mall's two-level rooftop parking arrangement. In fact, if you look real close in this photo, you can see a couple buses dropping shoppers off (or picking them up, whatever the case may be) on the second level. "Standing in the center of immense parking facilities, Northland, Detroit's new, great shopping center attracts buyers from a wide area." Well Northland's definitely got the parking covered, it would appear. And then some. "Southdale provided one of the most unique customer services ever - helicopter service. Customer could fly from Southdale to Dayton's downtown Minneapolis store, the airport or downtown St. Paul. The flying time between locations was 10 minutes. The first passenger was Mr. William Crear, Jr., executive vice president and general manager of Southdale. 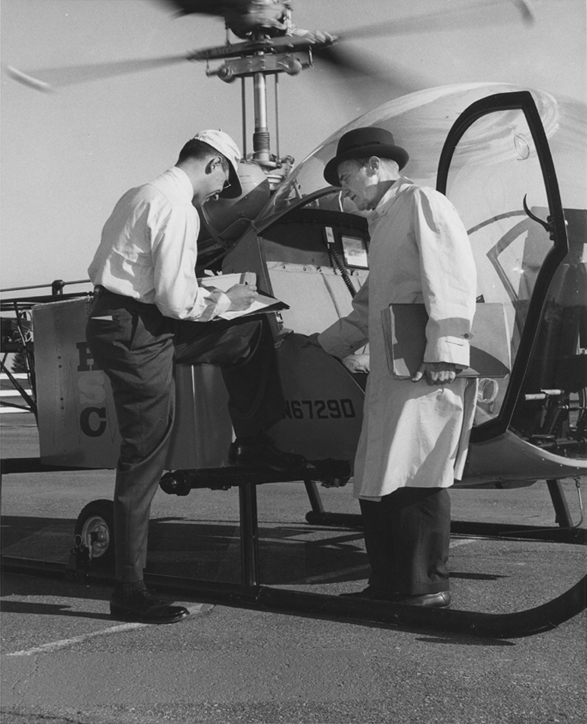 Mr Crear, seen here with pilot Donald Heyden, traveled to Dayton's rooftop heliport in downtown Minneapolis." (Excerpt) Now that the dust has settled at the nation's malls from the Black Friday frenzy, it's time for Cyber Monday, the ceremonial kickoff to the online holiday shopping season. Nearly 61 million consumers plan to shop online from home or at work today -- up from 51.7 million people last year -- in what is expected to be one of the biggest online retail days of the year, according to the Shop.org, the online wing of the National Retail Federation. 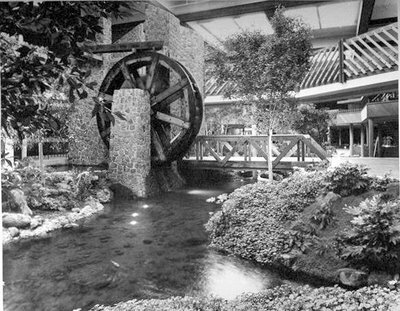 The impressive sixteen foot high water wheel that made up part of the miniature indoor "mill" that sat over a lush tree lined, landscaped creek, winding its way through the courtyard of the Old Mill Shopping Center. The setup reminds me of a similar one I blogged about before that once existed at the Golf Mill Shopping Center--only this one at Old Mill was inside the mall! Pretty cool, huh? The Old Mill opened in 1976 as a boutique shopping center, the "Ghiradelli Square of Mountain View" as it was known. Stores and restaurants surrounded a two story atrium that contained a creek, old wooden mill, and large living trees and luxurious landscaping. Fargo's was a popular teen hang out, La Posada a popular Mexican-American restaurant. The mall fell on hard times in the 1980s, and after a failed conversion into a "public market" (without the creek and trees), it closed in 1989. The site is now home to the landmark New Urbanist "Crossings" neighborhood. This vintage ad is via Ian Lind's "Old Kine" Pictures page, where you can also check out several photos of the actual protest outside Kahala Mall that night, as well as read more about the event and what took place. Quality isn't great on this vintage postcard image of the Crossroads Shopping Center, but I'm going to use it anyway because this is a mall I haven't covered here yet (though I did cover a Crossroads Shopping Center in Omaha before), so I want to at least get it represented in the archives finally. Meantime, I'll look for a better version for future use. 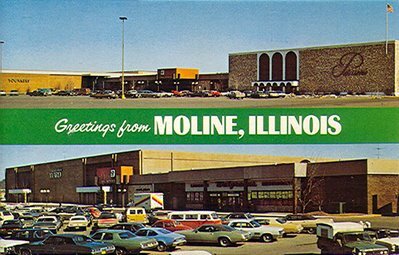 "...the dominant shopping center in northeast Iowa with a trade area that extends more than 50 miles. Its anchor stores include Dillard's, JCPenney, Sears and Younkers. The key retailers in the mall include Scheels All Sports, Old Navy, Victoria's Secret, Bath & Body Works, The Buckle, PacSun, Maurices, Chistopher & Banks, Journeys and Finish Line. The mall is located in the heart of a retail hub that includes a new 12 screen theater, Best Buy, Super Target, Super Wal-Mart, Barnes & Noble, Bed Bath & Beyond and many other national tenants." 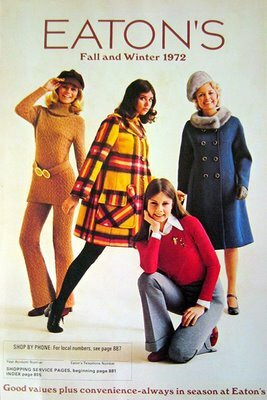 (Excerpt) When Twiggy made her 1967 U.S. tour, she deigned to put in a personal appearance at only one department store. The same store was one of the first in the U.S. to introduce men's Carnaby Street fashions. It has also brought in Simon & Garfunkel, Dionne Warwick, and Spanky and Our Gang to entertain shoppers. Among art fanciers, it is known and respected for its Gallery 12, which sells Tom Wesselmann nudes as well as $8,000 Marisol wood sculptures. The store is Dayton's of Minneapolis, which has exhibited a flair for showmanship that has been emulated by some of the biggest names in U.S. retailing. 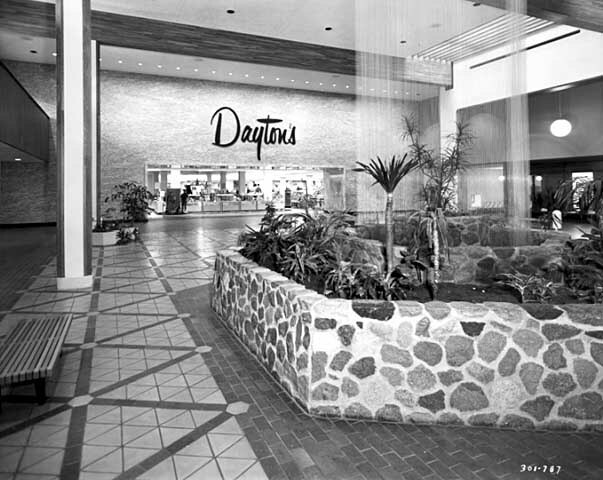 Still, the showcase downtown store is only one part of the fast-growing Dayton Corp., which by the end of 1968 will include ten other department stores, eleven discount outlets and a chain of 27 bookshops. 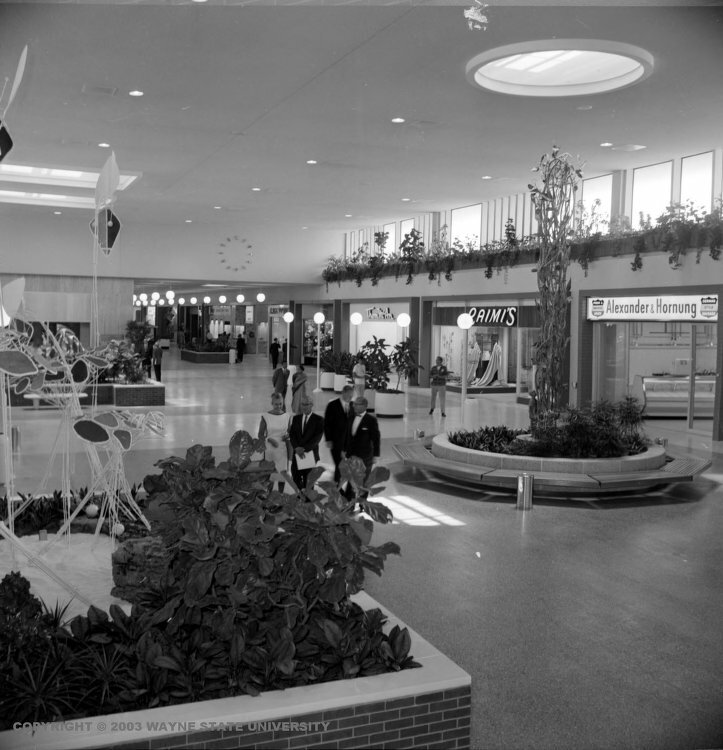 Dayton's anchor store and interior court area views, inside the Brookdale Shopping Center in the late sixties. I've always dug that stylish Dayton's script logo, and it just seems to go so well with this rather swinging looking shopping mall! Brookdale Center is a large shopping mall in Brooklyn Center, Minnesota. It is anchored by Macy's (formerly Dayton's, then Marshall Field's) and Sears. It is part of the four "Dale" shopping centers circling the Twin Cities, originally developed by The Dayton Co. The others are Southdale Center, Rosedale Center, and Ridgedale Center. (Excerpt) Oklahoma-born Gerri Von Frellick reached Denver 16 years ago with a $2 bill and $643,000 in debts, the wreckage of his overextended Texas construction company. Since then, Von Frellick, 51, has amassed a multimillion-dollar fortune by becoming one of the nation's more venturesome developers of shopping centers (two in Denver, one each in Dallas, San Antonio, Amarillo, Texas, and Boulder, Colo.). Last week, in the Denver suburb of Englewood, more than 5,000 workmen labored in three shifts around the clock to finish his latest and largest creation, 75-acre, $50 million Englewood-Cinderella City, in time for its scheduled March 7 opening. On the other side of town, Perl-Mack Construction Co., Denver's largest builder of tract homes, was putting the final touches on 73-acre, $20 million Northglenn Mall, due to open a week later. 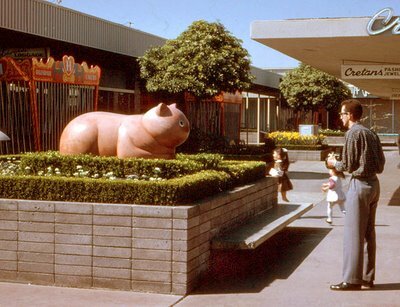 The striking "Red Cat" sculpture at Hillsdale Shopping Center, created by California-based Italian American sculptor, Benny Bufano. Some of his other works at Hillsdale can be seen in the Shopping Can Be Fun video I shared a while back. I also noticed that there are some circus cages in the background, so I'm assuming the shopping center was hosting some wild animals at the time. Besides the shoppers. Santa's Coming... to Midway Mall! 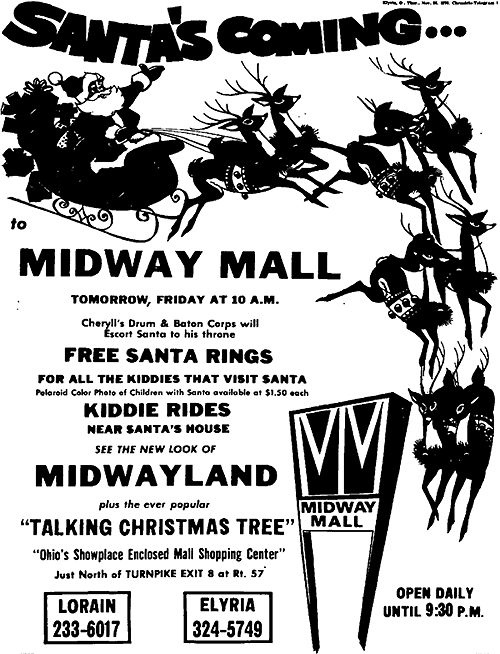 Sant'a arrival is heralded at Midway Mall, in this vintage newspaper ad. 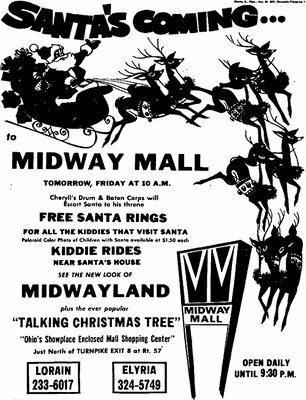 There will be free Santa rings, polaroids ($1.50 back then), and kiddie rides near Santa's House, in the new-look Midwayland! Plus, see the ever popular "Talking Christmas Tree"--all at Midway Mall, Ohio's showplace enclosed shopping center! 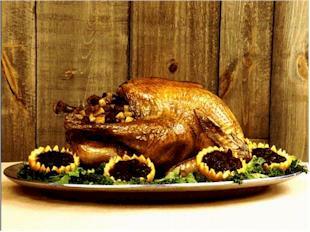 And, since today officially kicks off the Holiday season, this post is also a good time to wish everyone out there a very happy, safe, and above all, yummy Thanksgiving! Here's Southland's Wikipedia entry, for anyone who's interested in reading more about it. 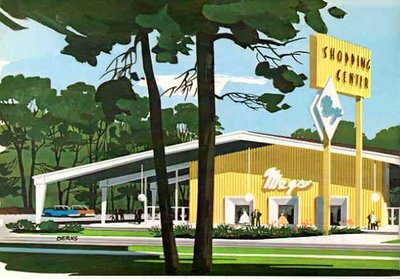 Vintage retail illustration art of a shopping center, from a 1962 Butler Building company catalog. I just thought this looked so incredibly swanky, groovy, retrolicious--all those things!--that I wanted to hang it here, in the Galleria. (Excerpt) A brother and sister leave home to wander through a place where exotic figures have the power to enchant and destroy. But the siblings are protected by an even greater force: goodness. At the end of a winding and hazardous journey, the wicked are vanquished and the children are redeemed. This Christmas the pair may be called He-Man and She-Ra, and their blond manes and mesomorphic torsos beckon from shelves in nearly every toy store in the nation. In other times the wandering children have been differently named and more modestly dressed. "I found some pics in my collection of the since demolished Plaza Pasadena in Pasadena California. 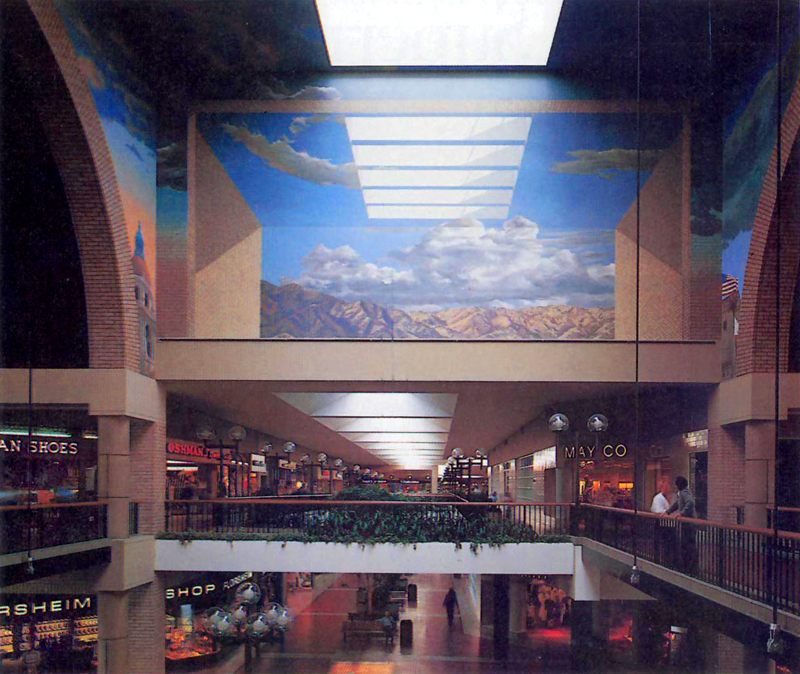 It was replaced by Paseo Colorado in the late Nineties. 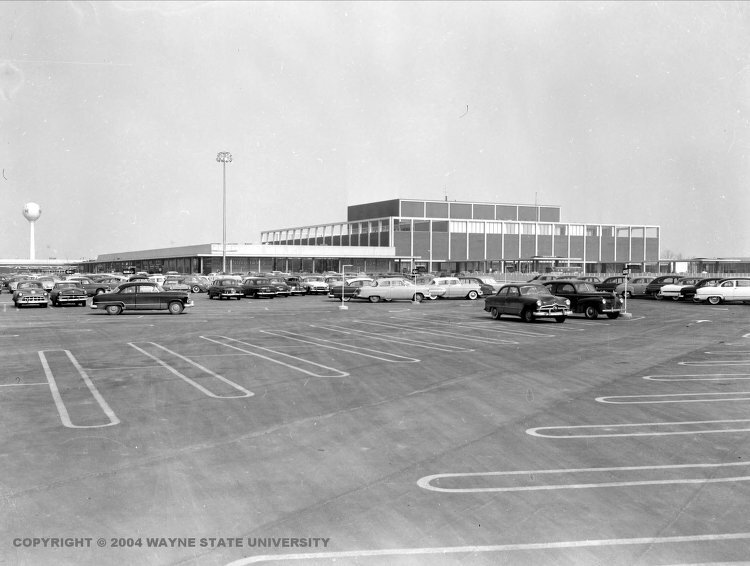 Nevertheless, the mall's architect was Charles Kober Associates and original owner Ernest W. Hahn, Inc. It was 750,000 [sq ft] and anchors were The Broadway, May Company, and JC Penney. It opened in 1980 or 1981 (I'm not exactly sure). Since my blog only covers northern California, I thought it would be cool to send the photos to you for the Malls of America blog." Indeed it's very cool, Scott, thanks again! I especially love the beautiful ceiling/wall mural paintings in this photo. Certainly gives this mall an open, airy feel. As always, the resource links below tell the complete tale. Not a shopping mall here (more into supermarket territory), but I thought this was a cute little short film that's close enough, so I'm posting it. Besides, I'm sure many of us are seeing the insides of the gorcery store much more than we even care to right about now, lol, so maybe this will help to put a more light-hearted spin on things for us. If nothing else, it's kind of fun (and silly) anyway. 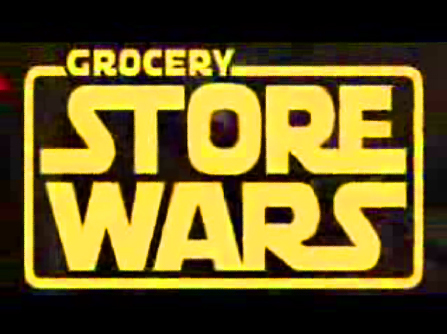 This is a parody commercial sponsored by the Organic Trade Association, using vegetables in place of the usual Star Wars characters, and it all takes place inside a supermarket. Yes, you read that right. Happy shopping! 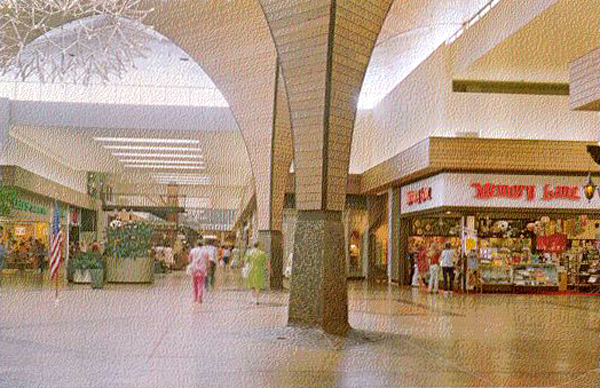 Pontiac Mall (renamed, Summit Place, around 1989), also dubbed "The Mall" in its early years (as seen in a previous entry), is seen here (postmark is late sixties) in this fantastic retro interior postcard view! A plethora of stores are visible: Singer, Zuibach's Suburban (have no idea what that was), an HHS clothing store, and a florist way down at the end, among others. Lots of neat sculptures and other decor flourishes in evidence, too, with a fountain in the court and also what appears to be an aquarium (clearer when magnified) in the center of the image--the aqua colored thing. Maybe it was just a display case, though, I'm not sure. This is another instance where I wish I could go back in time and walk around inside this scene just one froogin' time! Love to be there, at that time. Alas, according to most sites, Summit Place is now considered to be a "dead mall". To me it really sounds more like it's in the slow process of dying, though, since a truly dead mall, to my way of thinking, is one that's actually shuttered and/or gone. This one appears to be still hanging on, with lots of redevelopment plans in the works or underway. Check out the resource links below for more on that, as well as lots more history. I definitely suggest also taking another gander at this other post I did on Pontiac Mall last year, to see this interior from what appears to be the opposite end of this court. It's pretty nice, too! (Excerpt) Despite gyrations of the U.S. economy, retailers have traditionally counted on, and in most years enjoyed, enough business at Christmas to make being an American storekeeper worthwhile. But merchants this year are concerned that the 1981 Christmas selling season may turn into one of the worst ever. 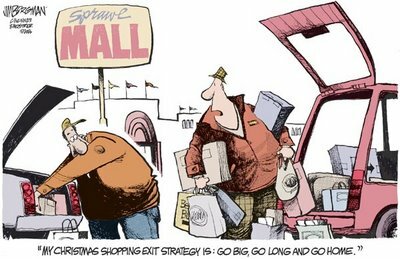 Recession, unemployment and high interest rates could deal a Scrooge-like blow to the holiday spirit of U.S. consumers. Stores anxiously waited last week to see the first indications of Christmas buying when the season officially started the day after Thanksgiving. Crowds jammed New York's Fifth Avenue, but there were more window-shoppers and browsers than buyers. 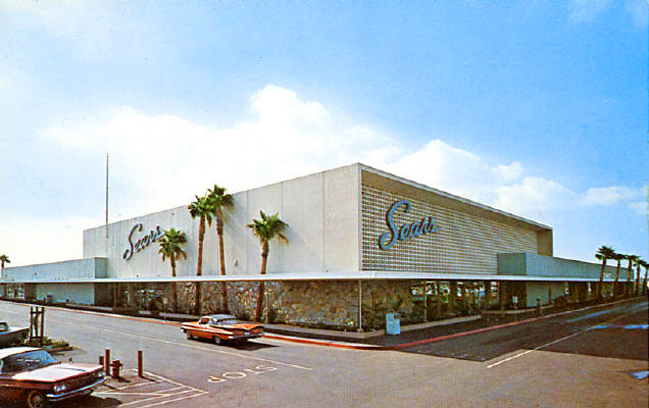 Pretty groovy looking desert-styled Sears store somewhere in the Phoenix area in the sixties (I did a little cleanup and color/contrast adjusting to the original image). I found this shot at the great vintage Phoenix site, acmeron.com, but all the caption says is "Sears Camelback", so I'm not sure which shopping center or plaza this was actually located in. But it's such a nice exterior I wanted to feature it. If anyone out there can help to positively identify where this was (which shopping center), it'd really be cool and junk. I'll update this entry when/if we can sort it out. I nabbed this postcard view off of an ebay or Yahoo auction a long time ago (intended to buy it but forgot to), and never have been able to get a crack at another, but I like the shot, so even though it looks kind of rough I think I'll add it to the archive anyway--at least until I get a replacement. Poor quality aside, I still think it's a fairly groovy image of the Valley River Shopping Center (as it's called on the postcard) in the 1970s--more commonly referred to as Valley River Center these days. There's a Memory Lane store clearly visible here, but what I really like is the gothic vaulted pillars & ceiling design going on (or whatever that is), which kind of puts me in mind of the interior courts of Tacoma Mall or Southcenter. Nice! Edit: Updated opening date below. Thanks Justin! 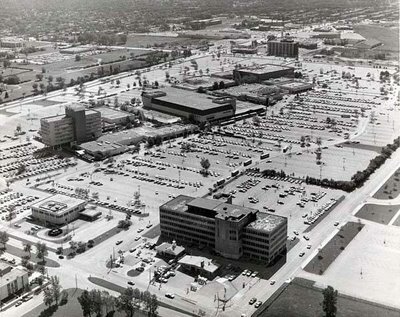 The Northland opening was the first major postwar development in suburban Detroit and was the first of many forays into the suburbs by Hudson's. Some $30,000,000 was invested in constructing the facility. The first-year gross for the Northland Hudson's was $88,000,000. Designed by Victor Gruen, the mall opened to much fanfare. Articles about the center appeared in national media outlets such as the Wall Street Journal, Time Magazine, Look, Life, Ladies Home Journal and Newsweek. All heralded that the concept represented the future of shopping in post-war America. 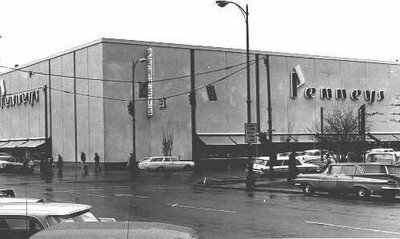 Besides Hudson's, Northland opened with a number of other prestigious local retailers including: Hughes & Hatcher, Baker's Shoes, Himelhoch's, Winkelman's, Kresge, Robinson Furniture, Better Made Potato Chips, Kroger, and Sanders in the two-million-square-foot center. 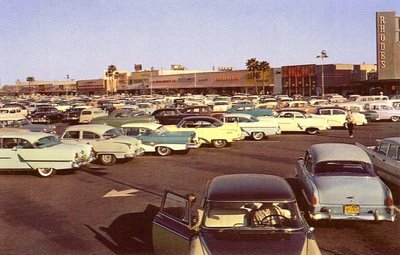 Northland featured auditoriums, a bank, post office, infirmary, sculptures, fountains, an office for lost children, lavish landscaping, and free gasoline for certain customers. (Excerpt) Detroit's population was at its peak of 2 million, the suburbs were becoming home for thousands, and women still shopped wearing fitted dresses with gloves, hats and pointy-toed stilettos. In 1954, Ford Motor Co. introduced the Thunderbird, and General Motors Corp. rolled out the Corvette. Dean Martin's "That's Amore" and Duke Ellington's "Satin Doll" streamed from car radios. And in Southfield, retail history was made. 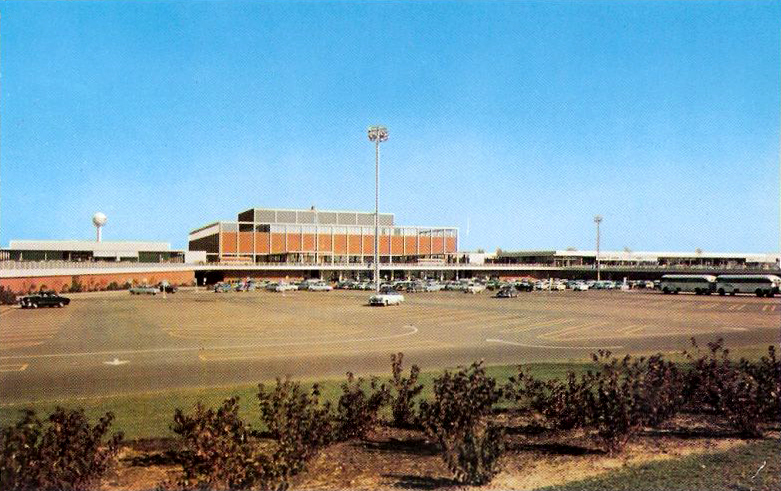 Northland Center turns 50 today. The mall rose to prominence when it became the nation's first regional shopping center. What now seems a common sight -- an island of boxy buildings surrounded by oceans of parking spaces -- pioneered at 8 Mile and Greenfield. This isn't vintage, it's going on right now. But I like stories like this. There's a Woolworths that's still going strong in Australia. The Australian-based company, Woolworths Limited, operates a bunch of stores and service centers throughout Australia, under the Woolworths banner. One is a major supermarket chain. This video is a recent TV news report about the ongoing struggle between the town of Maleny, a small village in rural southeast Queensland, that is fighting on a seemingly very united front, against the invasion of Woolworths into their town, where there's already a longtime IGA store that the locals are not only loyal to, but also standing behind, to keep the Woolworths corporate behemoth from swallowing up their hometown favorite (similar to our Wal-Mart battles in America, I guess). They maintain a site if you'd like to read more. You go, Maleny! Vintage postcard view of the Center Court and fountain inside the Apache Plaza mall. To me, this is one of those "quintessential" 1960s mall photos. The kind that really displays all the color, mood, and yes, tackiness (but in a good way), that truly defined the decadent shopping malls of that era. This easily ranks as one of my own personal favorite shots here so far! Sadly, the place was demolsihed in 2004, but reading up on it and looking at many photos online, it's easy to see why this quirky, colorful old mall is still so deeply loved (and missed), by fans like Jeff Anderson, the cat behind the fantastic fan tribute site ApachePlaza.com. Heck, I've never even been there myself, yet now I miss it like an old friend! The links below will lead you to all the history info you'll ever need on this mall. 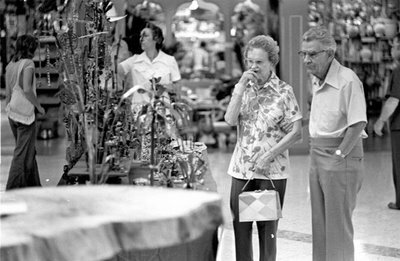 Arts and Crafts Fair at the Desoto Square Mall in 1977. They'll know what they like when they see it. This might not be it. (Excerpt) A fantasia of fountains adorns Downtown, U.S.A.
Water. Shapeless in itself, it can take multitudinous shapes. Colorless in itself, it can produce iridescences beyond any artist's palette. Soundless and inert in itself, it can in action induce a sense of rushing speed and frenetic energy; in tranquillity, a sense of meditative peace. In the most bleak of concrete jungles, water is a hope and a memory, a green thought in an ungreen shade. Ever since Moses struck the rock and brought forth water, it has been both a miracle and a counted blessing, one humanity has done nothing to deserve but cannot live without. And like all such blessings, people have been fiddling with it ever since, among other things to suit their convenience and enhance delight. At least as far back as Babylon, architects and engineers have tried to shape water into an art form. Another vintage retail educational film. I wish this was brighter as the picture's pretty dark at times, but I still got a kick out of it anyway and think you guys will too. This one covers a marketing class that goes on a field trip to a Montgomery Ward store to learn the ways of effective catalog merchandising and the overall American system of buying and selling goods. It takes a few minutes (of its 22min length) to start getting to the point, but it does eventually--in typical fifities cheesy, heavy-handed style! 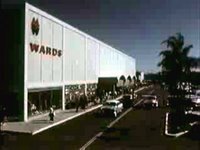 There are some nice shots of '50s era shopping centers and department stores (including Montgomery Ward of course) laced throughout, which also makes this worth watching. "Country Club Shopping Center. One of Sacramento's most complete suburban shopping areas, with ample free parking. Located on El Camino near Watt Avenue." Edit: Thanks to Randy, for positively identifying this shot for me. Earlier I had it posted as the Country Club Plaza Mall, which though right across the street (you can see it in the aerial), is not the one pictured here. This is the Country Club Centre. My confusion came largely from the postcard caption itself, which does read exactly as I have it above. But anyway, I think we're all set now. Above is a moody print by American photorealism painter, Richard Estes. 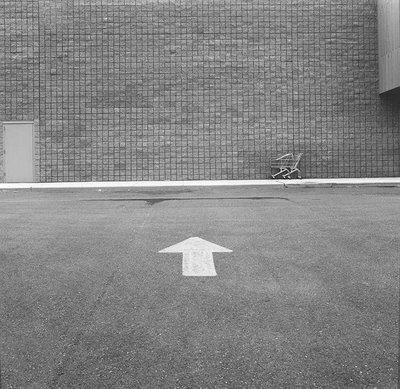 The shopping center scene captured here is a part of his Urban Landscapes III series. When I first saw this I thought it was a real photograph! And the original is even more impresssive than this small, highly compressed jpeg file which doesn't really do it proper justice. I really love this piece. Aerial view of the Old Orchard Shopping Center in Skokie, Illinois in the late, groovy 1960s. "...The newly purchased area was rectangular in that it was longer east/west than it was north/south. 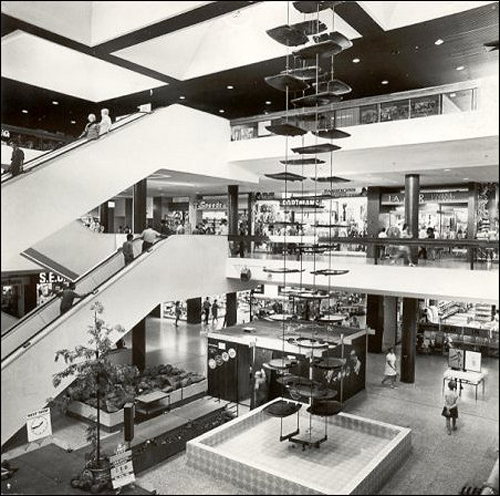 Von Frellick would not let the area restrict the mall's size, so he designed it with an unorthodox shape. Looking at an aerial photograph, the mall appeared to be a large 'M'. Each leg of the 'M' shape would have a code name. 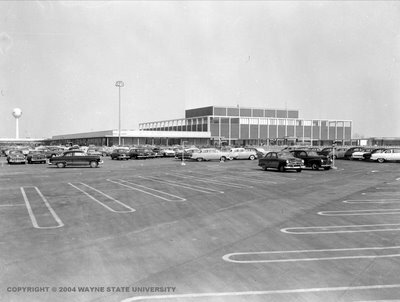 On the second floor, the western wing of the mall was named Rose Mall, and the eastern wing was named Gold Mall. 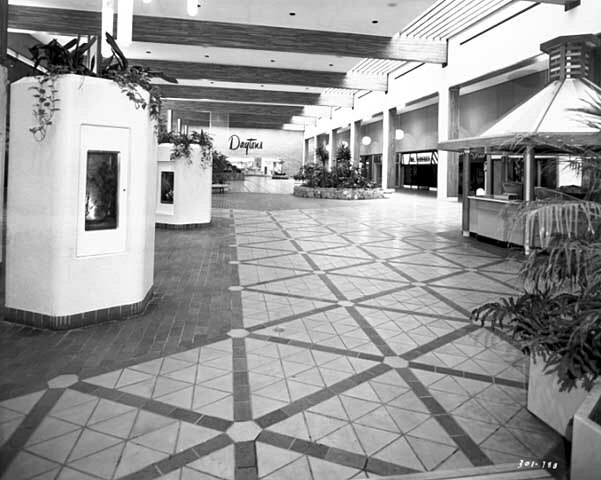 On the bottom floor, the corridors were Shamrock Mall and Cinder Alley, respectively. The original plans called for a structure with a one block cylindrical center court, four anchors, and surrounded in parking garages. As the plan was eventually refined, the 'M' shape remained, although minor changes were made to other components. The mall's parking structure was unique as well. From adjacent streets, a look at the mall would reveal a seemingly regular parking lot at ground level. However, additional parking existed in an underground garage located beneath the mall." (Excerpt) In the late 1800s, the Arcade Mall was a bustling indoor marketplace, just steps away from Main Street and the vibrant city of Bridgeport. Among the earliest enclosed shopping malls in the country, the mall is crowned with a spectacular domed ceiling of glass that lets light flood a two-story space below, where merchants once sold everything from meals to Singer sewing machines to fine hats and coats and treasures from Hubert's Art shop. Until last year, the Arcade Mall still had a few tenants - a barbershop, a nail salon, a tattoo parlor and music stores - but it had fallen into disrepair. Now the once grand shopping center and the old red-brick hotel where it is located are undergoing a $22 million restoration and conversion after the city assumed control by eminent domain. Lonely moment in time captured by famed photographer, David Plowden, at an unnamed shopping mall on Easter Sunday Morning in 1981. 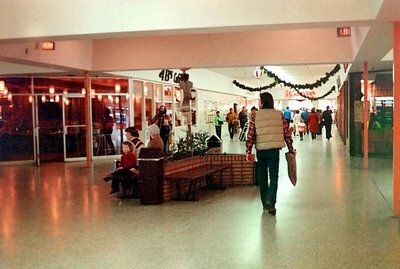 Here's a nice little shot of the Capital Hill Mall (another new mall I haven't yet blogged here), during the holiday season in 1980. 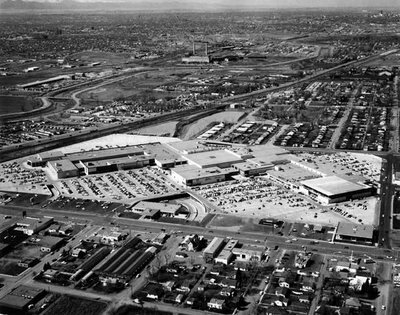 I don't know much about this mall that I can add here, but just looking at the picture you can see there's a 4-B's Cafeteria on the left in this view (never heard of those myself), and a Hennessey's anchor store down near the end. 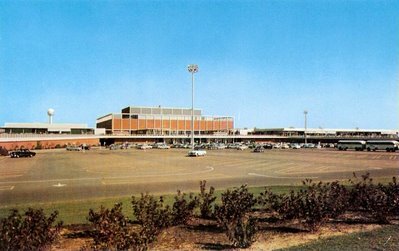 Please do comment if you have any memories or info to share on this mall. 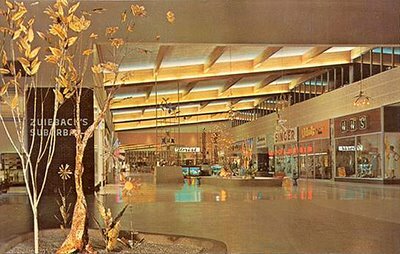 Man, Westland Center was just so incredibly swanky and beautiful in the '60s, it's probably one of my favorite malls to dig into at MOA. I never tire of looking at its vintage interior! And there's certainly lots to see here in this photo of the West Court, taken in 1965 when the mall first opened. On the right is an Alexander & Hornung butcher shop, Raimi's window and curtain store (owned by Hollywood director Sam Raimi's mother), and a Thom McCann Shoes, among others. Can't see it here but just to the left of this view was a Kresge store, which you can see in this cool color photo I shared previously. I'm thinking this might be a picture taken prior to the mall's official public opening (or very early on after it at any rate), because the Alexander & Hornung shop looks rather empty of merchandise here (zoom in and it's even more evident), and also the clock has no hands yet. Maybe some clues there? 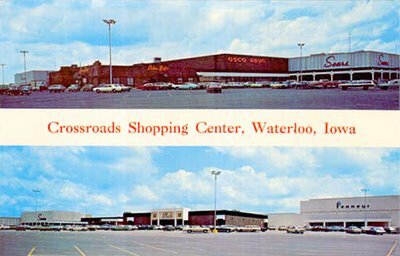 Westland Center is still there today and generally retains its overall original layout, but of course, isn't quite this groovy anymore. (Excerpt) Mall developers have rediscovered Main Street. Fifty years after the first strip plaza was created to serve North America's booming post-war suburbs, developers are going back to the drawing board. They're coming up with something they call "lifestyle centres," vast open air developments that combine shopping with homes, office space, restaurants and entertainment. They're all centred on a leafy "main street" where consumers are encouraged to stroll and sip coffee, rather than rush into their favourite discount outlet to make a purchase, and then rush off. 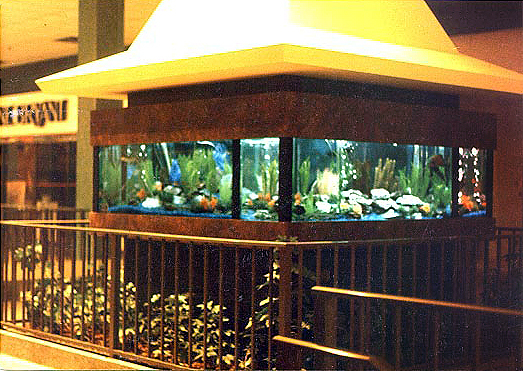 Aquariums inside Sunrise Mall. 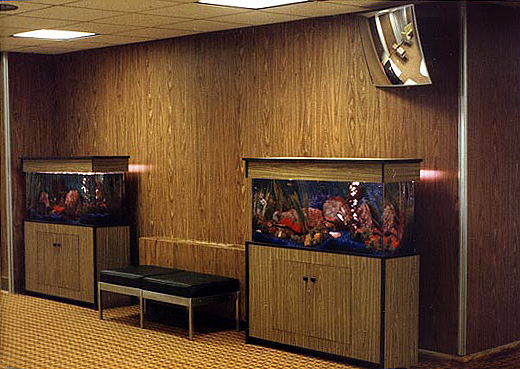 These were all built and installed in 1975 by Aquarium Network, out of Long Island (photos are courtesy of them). 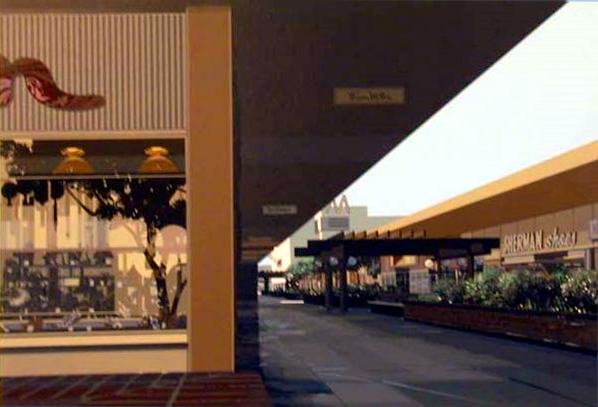 The large viewing tank above is sitting out in the mall proper and is probably very similar to the one I just pointed out recently in a Topanga Plaza entry. I'm not exactly sure where the two in the second photo above (90 gallon free standing jobs), were (are?) located in the mall, so my question is, does anyone out there actually remember these tanks in Sunrise Mall, or know if they're still there? I'm betting they aren't, as most malls have now gotten rid of all the cool relics like this from their "vintage" past. But who knows. For a brief rundown of this mall's history, click here. 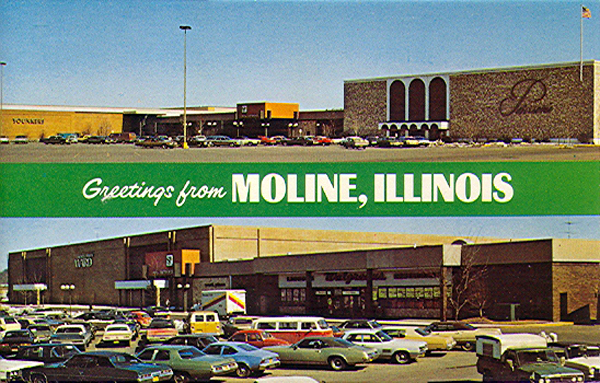 Greetings from Moline, Illinois--and SouthPark Mall! This is an old postcard view (if you couldn't guess) showcasing another "SouthPark", this one not in North Carolina for a change. 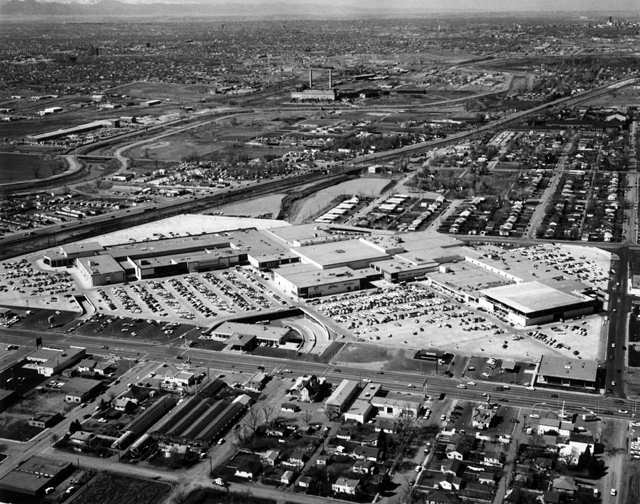 "Southpark Mall was built by General Growth Properties at a cost of $12 million on 47 acres (190,000 m²) of land that General Growth purchased in 1966. 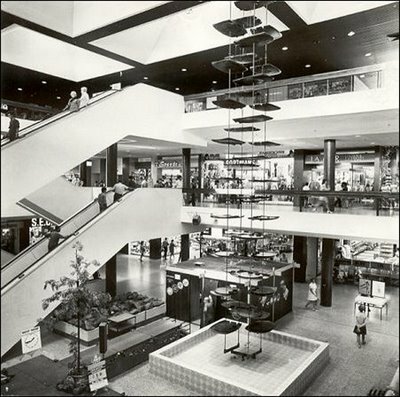 Montgomery Ward, Petersen Harned Von Maur, and Younkers were the mall's three original anchors when it opened on February 27, 1974. 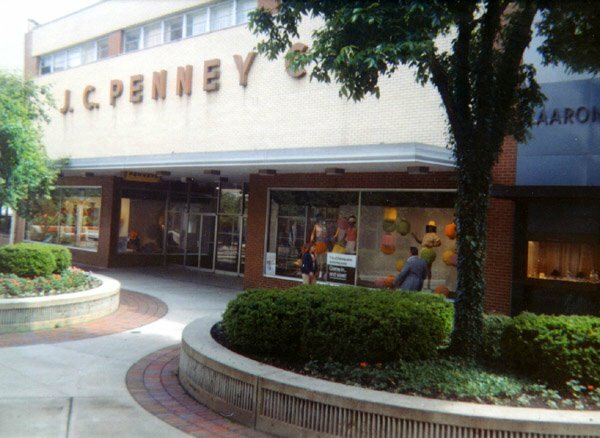 Southpark has been expanded twice: JCPenney was added in 1978, while Sears and a food court were added in 1990. Montgomery Ward closed in early 2001 when the chain went out of business, and the anchor space remained vacant for three years. Dillard's eventually leased the space, and they rebuilt the space, which they then opened in 2004." Additionally, see this article for a nice history on this mall.